Answer ID 5316: How to physically connect, disconnect, and install a WD external / easystore drive on a Windows PC or Mac. Answer ID 3865: How to Partition and Format a WD Drive on Windows and macOS. Important: Reformatting the drive will erase the pre-loaded software, if it is not possible to save the software that came with the drive, it can be found in the Downloads Library under each specific drive's page. However, it is required to register the drive in order to download any restricted software. To begin, access Disk Management by right-clicking on My Computer and left-click on Manage. The Computer Management screen will open. If the My Computer icn is not seen on the desktop, it should be located in the Start Menu. Computer Management can also be accessed from the Control Panel under Administrative Tools. When Computer Management opens, it will have two panes. On the left pane, there will be a list of items. Under Storage, click on Disk Management. This will load a right pane with 2 windows on the right side. It may be a good idea to maximize the Computer Management window to see all listed drives. In the lower right pane contains a graphical list of all available drives or devices. Find the drive listing that corresponds to the drive to partition and format. It typically has a black bar indicating unallocated space. Important: The drive may need to be initialized. If so, please see Answer ID 1018: How to initialize or write a signature to a secondary hard drive or Solid State drive in Windows for more information. If there is a blue bar, then the drive has already been partitioned and formatted. Make sure, that if you have data on the drive, back it up before proceeding. 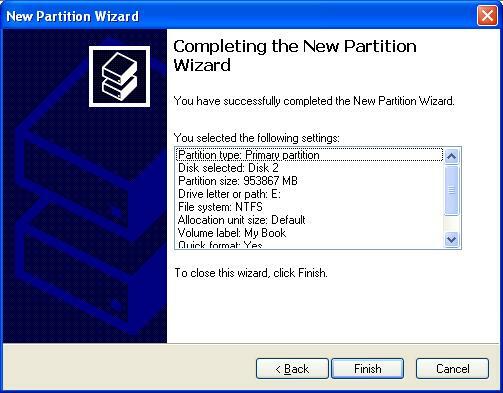 When ready to proceed, right-click on the blue bar and choose Delete Partition... You will get a pop-up window asking you if you really want to delete the partition. Click Yes. The bar should now be black. If the drive does not show up in Disk Management, then please see Answer ID 1164: WD external drive is not seen by Windows or Mac and data on the drive is inaccessible for more information. Windows XP does not support GUID partition tables, for drives larger than 2TB (Terabytes). It's best to use the WD Quick Formatter utility and select the Compatibility check box from the XP machine. Please see Answer ID 3868: How to format external drives using WD Quick Formatter in Windows or Mac for more information. 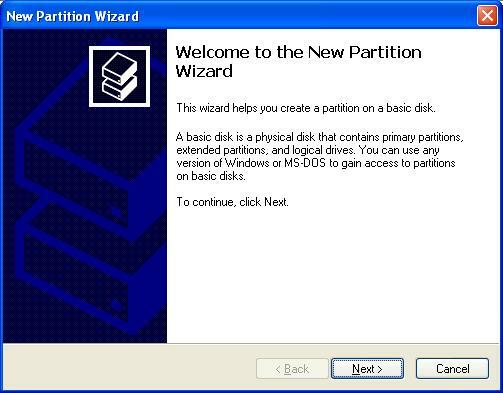 The Welcome to New Partition Wizard will come up. Click on Next to proceed to the next screen. Choose Primary Partition and press Next. This is where you can set a partition on the drive. By default Windows chooses the whole drive so click on Next. If the user would like to create multiple partitions on the drive, please type in the amount in megabytes desired for the Primary Partition, and it will partition and format only that amount. For example, using a 500 GB hard drive and it's desired to split the drive into two partitions, type in 250000 (for 250 GB's) in the Partition size in MB area. After formatting this first partition, the user will need to go back and follow the above steps again to partition and format the left-over unallocated area of the drive. 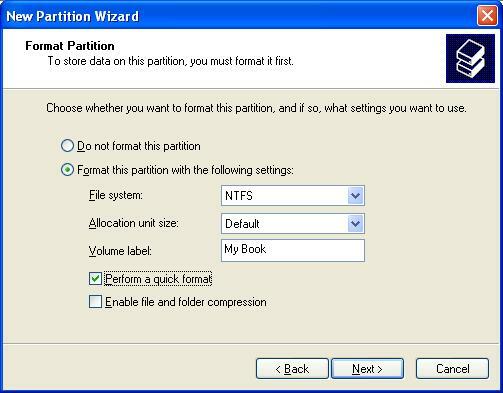 The next time around, however, choose Extended Partion at the Select Partition Type window. (Look at previous step.) Remember, to change or add partitions, will destroy any data on the drive. 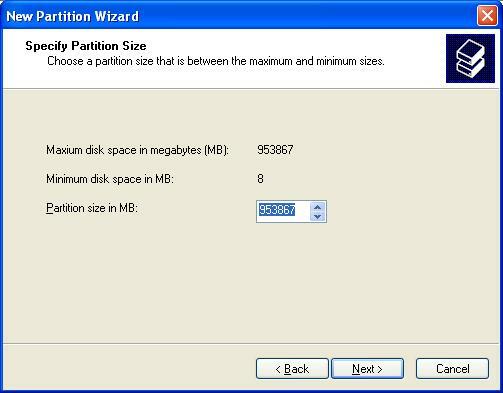 So, be sure to plan out ahead how many and what size partitions you want before creating them. Choose the drive letter that you want the drive to have. By default Windows will choose the next available drive letter. Then click on Next. This is the format screen. Make sure that the File System is set to NTFS. In the Volume Label field you can give the drive a name if you want. Check the box that says Perform a Quick Format so that the drive will be formatted quickly. Make sure to leave the Allocation unit size to Default, and then click Next. This screen gives you a confirmation of all the steps that you just went through. Click on Next. The listing for the drive (Disk 2 in the picture below) will say Formatting as it formats the drive. When the drive is done (Disk 2 in the picture below) the bar will be blue and the drive will say Healthy.